It seems strange to be posting a Christmas card with the beautiful weather that we are having at the moment, but if I want to get a head start then it must be done. I've used a favourite stamp from my stash and I can't remember where it came from, although Creative Expressions springs to mind from somewhere. I stamped onto some water colour card stock and then using a mixture of ink from Distress Ink pads and Aqua pens I coloured the image and the background. 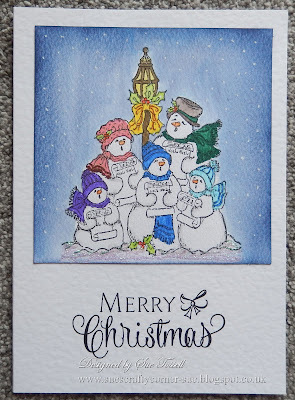 I added a little glitter glue underneath the snowmen and distressed the edges with Stormy Sky Distress Ink. 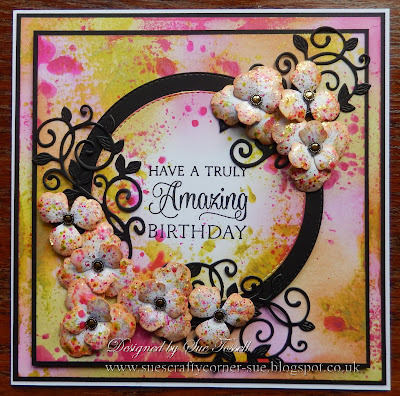 I mounted onto an A5 card base and added a sentiment from Chocolate Baroque. Of course I didn't stop at one card I made eight altogether. Thanks for taking the time to look and your kind comments which are always appreciated. I been rather quite lately what with my Mum coming home from Hospital (glad to say she back to normal now) and the Easter hols. But in between I have managed to get some crafting done, just not had time to share with you all. Here is my card for today, it's similar to one that I made at a Phil Martin workshop at the end of last year but I've put my own twist on it. I started with an 8x8 card base and black card for the matting, some white card cut slightly smaller than the black which I coloured with distress inks. I then sprayed Dylusions Shimmer Sprays onto my glass mat and mopped up some of the colour onto the background I had made. I repeated this for the centre circle and added a sentiment from Chocolate Baroque. I made some flowers that from a die that was bought from the Internet and mopped up more spray from the mat before putting together on the card with some die cuts of leaves, from another die bought from the Internet. Hope you are all enjoying this wonderful weather that we're having at the moment, I'm off to my Sister-in-laws this afternoon. Thank you for taking the time to look and your kind comments which are always appreciated. Two weeks ago I managed to blog every day and I was hoping to keep it up or at least blog more often. But like most things life has other ideas and last week my Mum was rushed into Hospital. I'm glad to say that she's on the mend now and should be coming home this afternoon. I'm waiting for a phone call as I'm posting this card. Hopefully I will be able to resume blogging again. 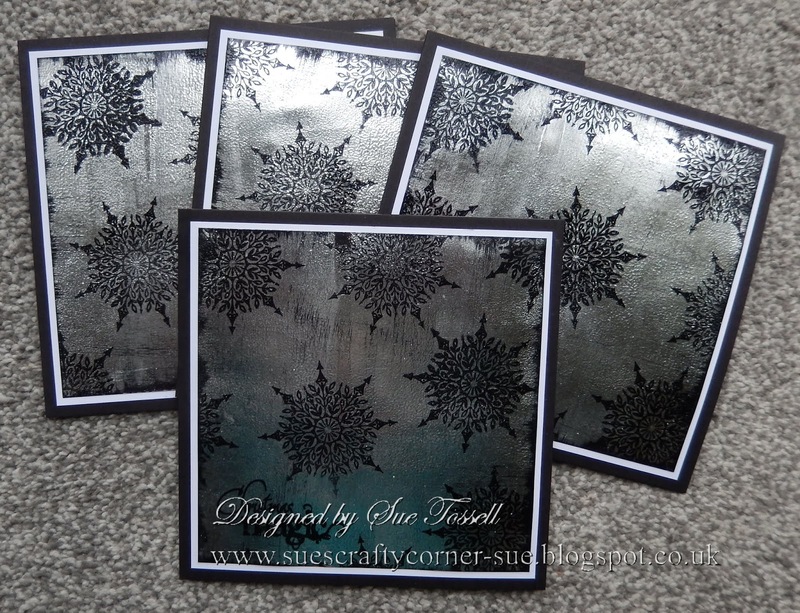 My card is for the current challenge over on the Allsorts Blog which this week is Sentiment In Focus. For my card I used all Crafters Companion Products, starting with a 3D embossing folder which was given the distress ink treatment. 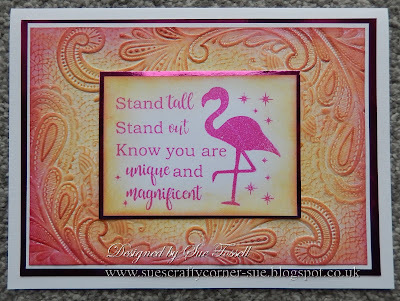 Then I used one of the sentiments which was a fairly recent release form Crafters Companion, I distressed the edges with the same colours that I used for the embossed background. 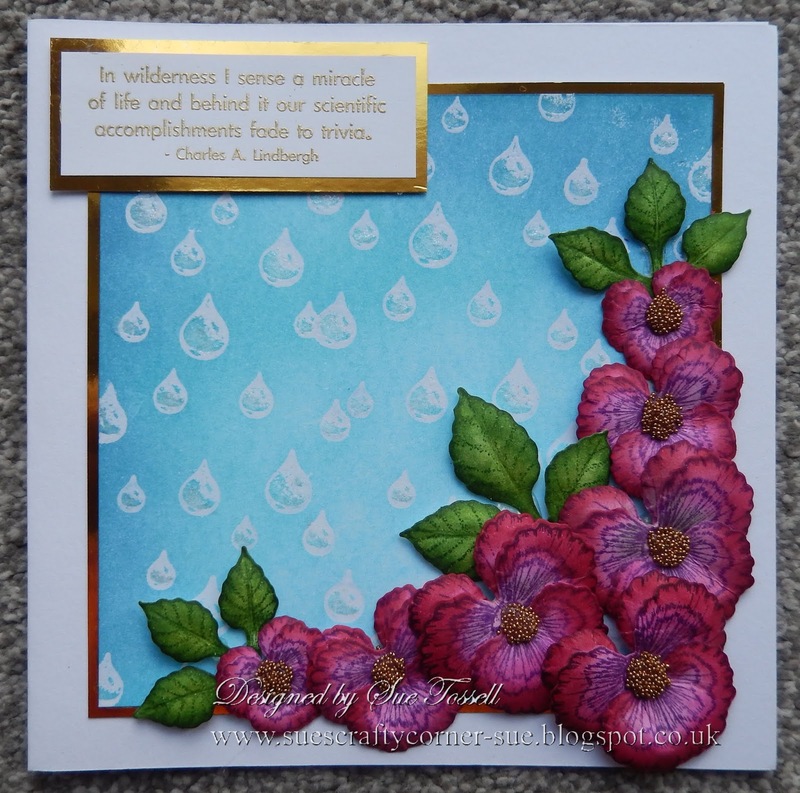 At the end of February I was very lucky to win the Challenge over on the Stamping Sensations Challenge blog. 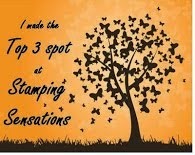 The lovely ladies at Stamping Sensations have have asked me to be their guest this month April, for their new challenge which for this month is April Showers Bring May Flowers. 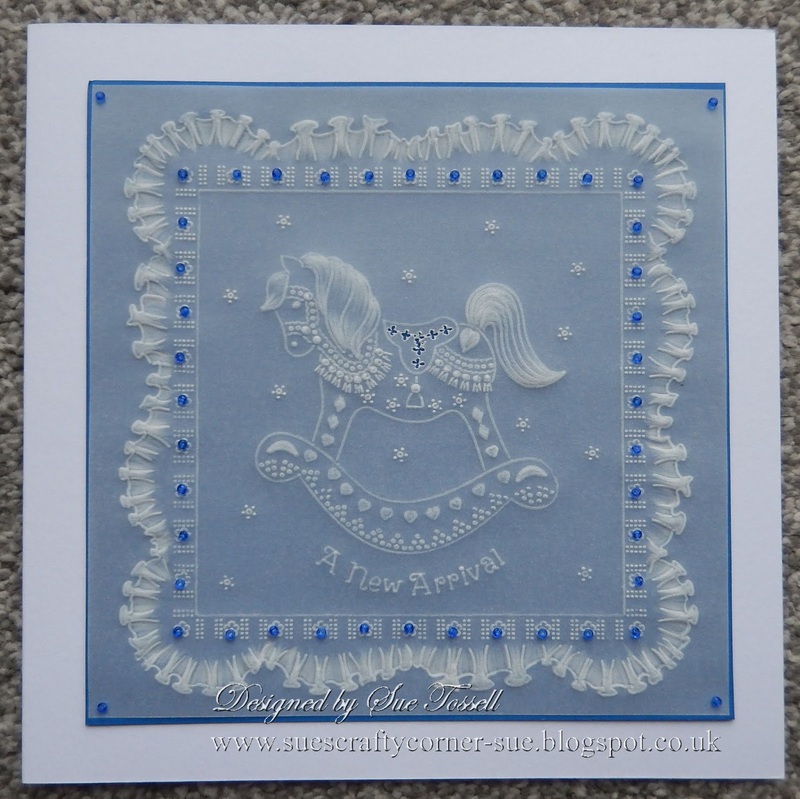 I used a mixture of stamps to make my card starting with the Rain Drops stamps by Ryn, which I embossed with white embossing powder before blending blue ink all over the background. I then stamped and coloured some Heartfelt Creations stamps, Cheery Pansies and adding some micro beards to the centres. I mounted the background and the pansies onto some gold mirri card and popped onto a 7x7 card base. 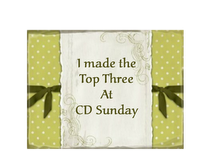 Finally I settled on a sentiment from Stampscapes which I felt went with the nature theme of the card. 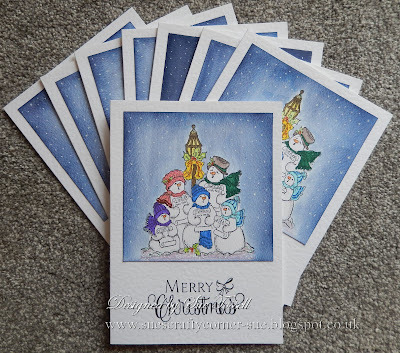 Do pop over to the Stamping Sensations blog and take a look at the fabulous cards that the DT have provided for inspiration this month, along with a great prize too provided by Be Creative who are giving a £25.00 voucher to spend in their store. 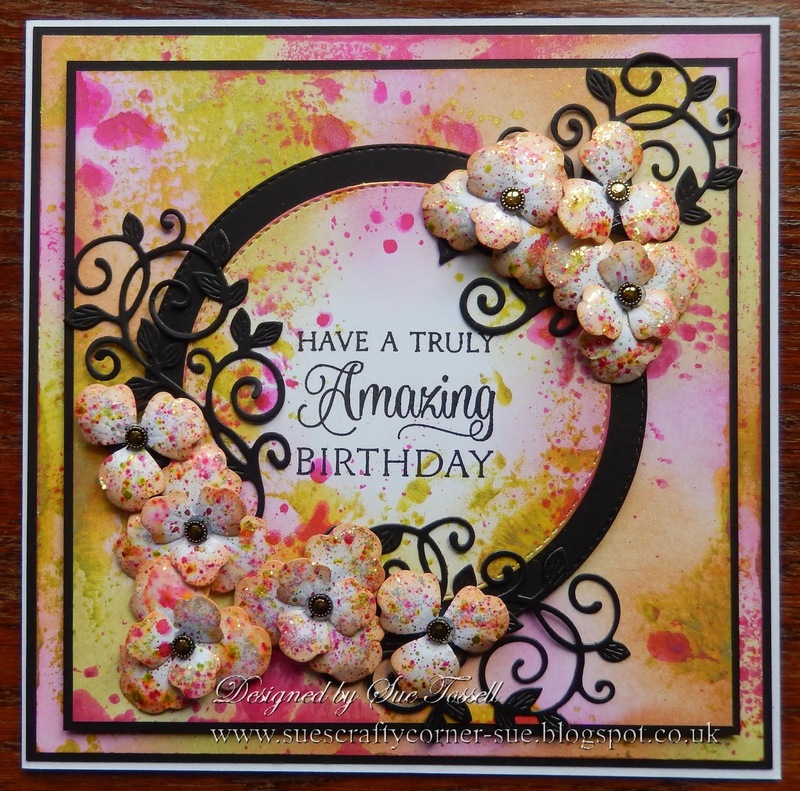 When I saw what the challenge was over on the Allsorts Challenge blog this week (it's to use Yellow) I knew straight away what stamps I was going to use. I have fallen in love with the Pink Ink stamps and am now the proud owner of 11 of them. 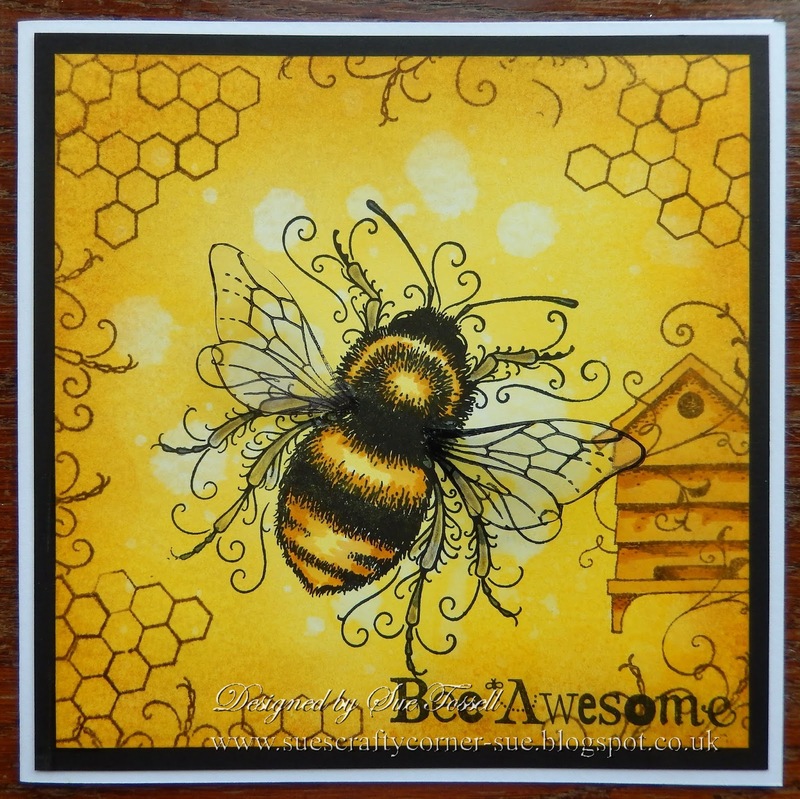 This is the first outing for not only this beautiful Bee but of any of the ones that I have.The bee is quite a focal point as the card base I used is 7x7. 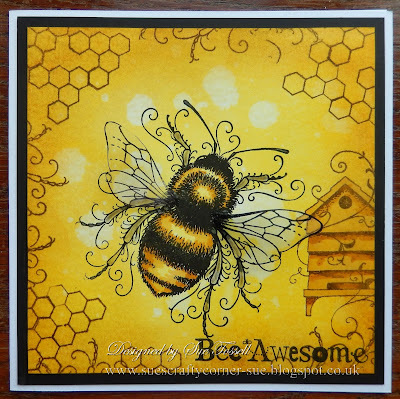 I stamped using a stamp platform just to make sure that I got a good image before changing to a smaller block to use some of the extra stamps in the set around the outside of the card. Then I stamped onto heat proof acetate for the wings using StazOn,, again I used the stamp platform for this as I find stamping onto acetate a bit tricky. Then I coloured in the back with a clear sparkle pen and left to dry before cutting out and sticking to the bee. I don't think you can tell that they are separate in this photo so next time I might just try a pale blue sparkle pen. I've noticed that there is a new Christmas Challenge blog on block, Christmas Kickstart Challenge. I think it a two week challenge and this time they are asking for cards with die cuts. 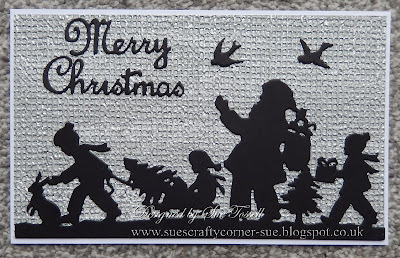 For my card I have used a die from Spellbinders that was released last year in a bundle of Christmas themed dies. I cut it from black card and then with some textured wallpaper that I found in a DIY store (I took a largish sample) I made a backing paper. 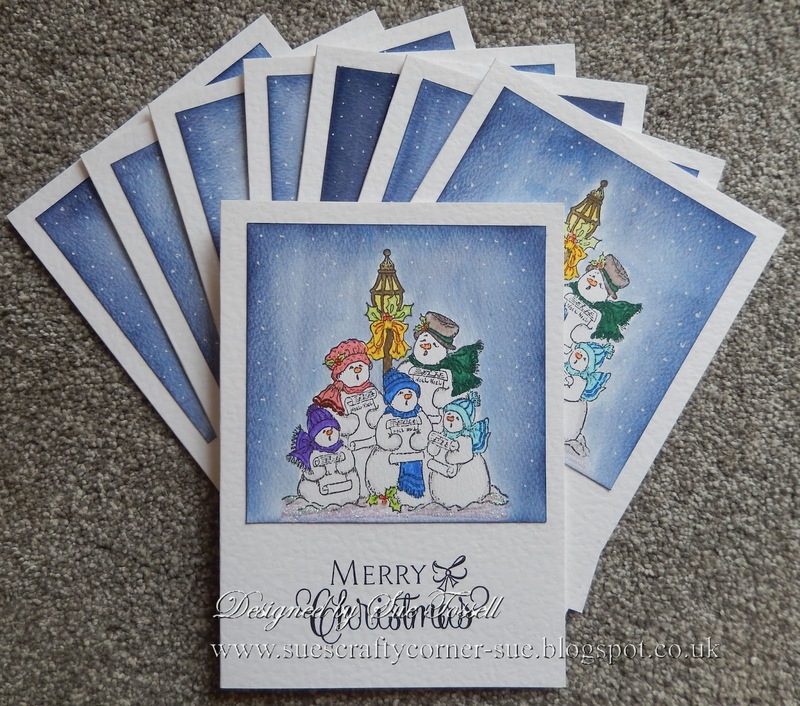 It has a rather nice silver sheen to it and there was enough there to make 9 cards all the same. 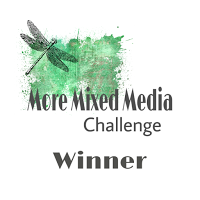 I'm off now to join in the challenge. I'm not sure how I've managed to post everyday this week, hope I can keep it up. I'm back with a card today that I've made for my Mum for Mother's Day. 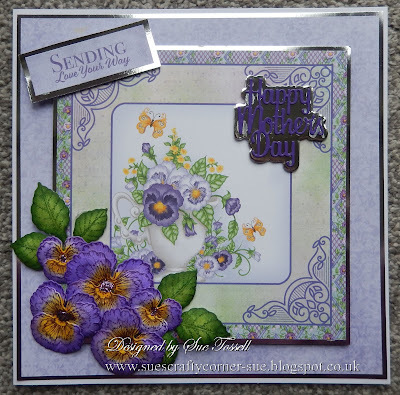 I used the Burst Of Spring collection from Heartfelt Creations for the card, the pansies from this collection are gorgeous. 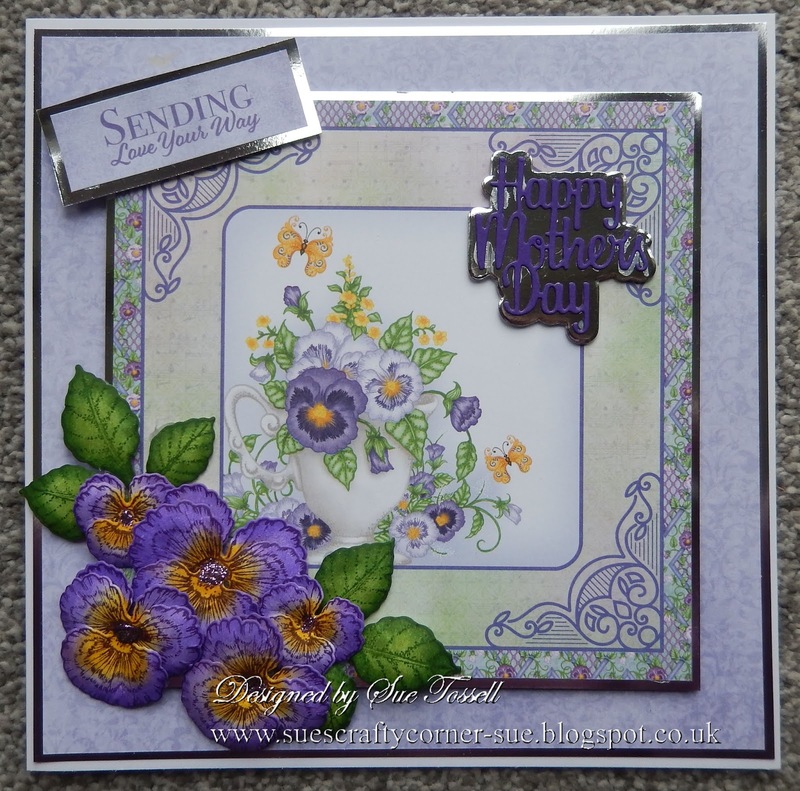 I used ink pads and dabbers to colour the pansies and added some matching stickles to the centres. The sentiment die used is from The Paper Boutique. The challenge over at My Time To Craft is Mothers Day/For A Female so I'm going to join in this week. Well things have settled down here after the excitement of last week so I made time to make a card to enter into the Allsorts Challenge this week which is Feathered Friends. 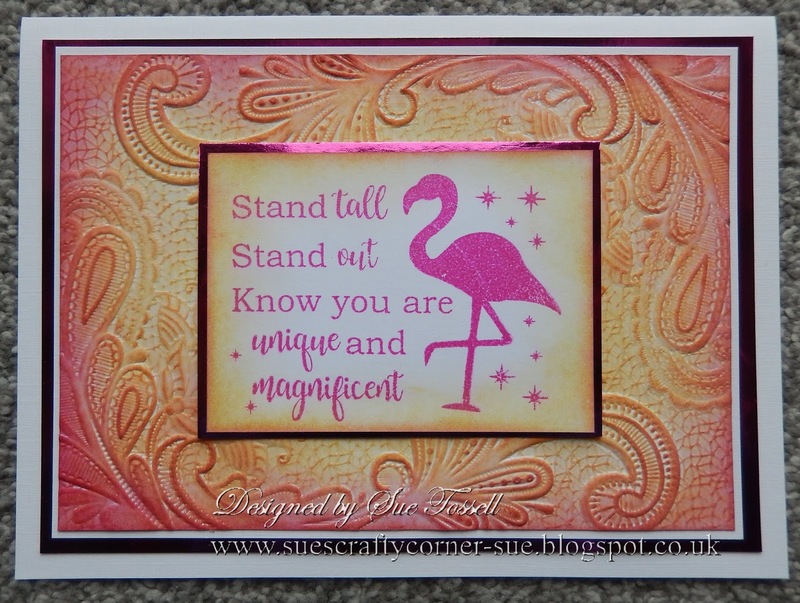 I've used a 5x5 card base and a stamp that was free on the front of Creative Stamping a couple of months ago, where there was a whole A4 sheet full of stamps with birds and related things. 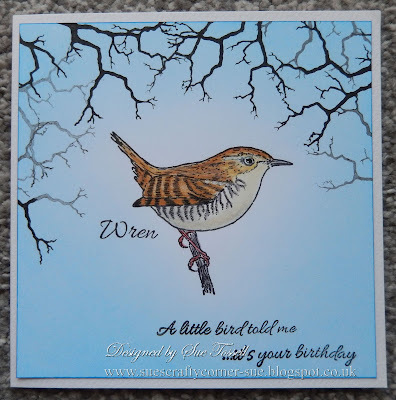 I used the Wren stamp, the reason for this is - outside my sitting room window is a large Clematis which every year blooms beautifully for a good 2 -3 months starting about the end of March beginning of April. After it finishes blooming a little wren can often be seen hopping about around the bottom of the plant, I not sure if it nests in there every year or just visits daily, I've never cut it back far enough to find out. The Wren stamp reminded me of this. 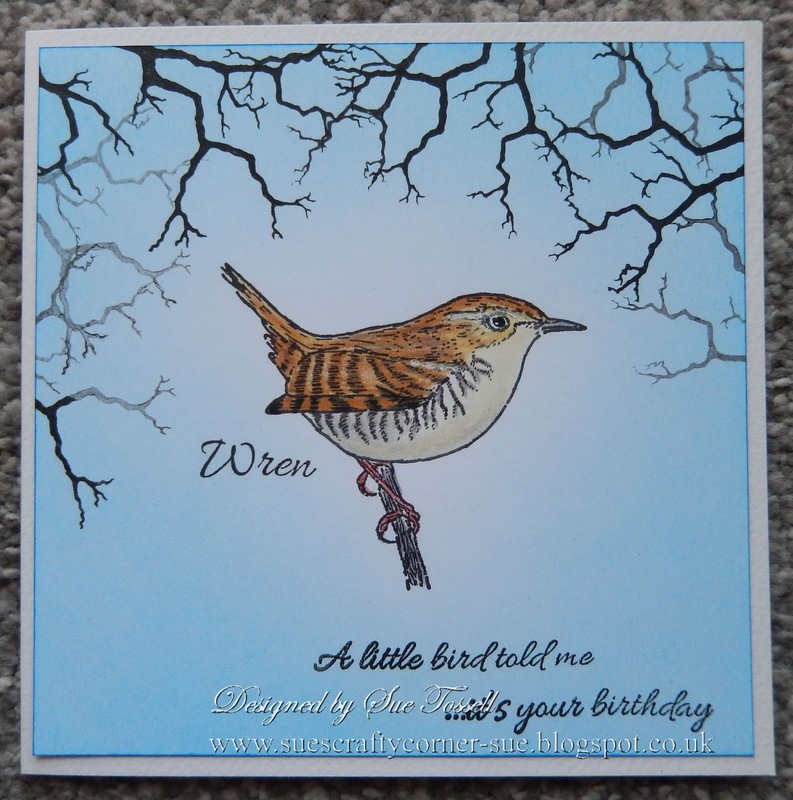 I coloured my Wren using pencils and made a brushed background using distress ink pads. The sentiment comes from the same stamp sheet and the branches were from a Lavinia stamp. Thank you for taking the time to look and your kind comment which are always appreciated. I would like to show off my new Grandson Eric Steven (named after his two Grandfathers). He was born on 18th March and although both of these photos were taken at the hospital he was born at home on the stairs, delivered by my son-in-law. My daughter said she had been having a few niggles but nothing major since about 2.00 in the afternoon. Then at 5.30 they got a bit stronger so I got a phone call asking if I would have our eldest grandson for the night this was about 5.55. Son-in-law dropped him off at 6.05 and got home just in time to ring the ambulance and be talked through the delivery. By 6.22 Eric was here. I'm glad to say that everything went well and apart from being taken to hospital and kept in for the night Mum and baby are both doing well. He wasn't due until today, so I had no card ready (it was still on my to do list). Andrew our eldest grandson loves his baby brother and delights in showing him of to all the visitors that they have at the moment, I'm sure that the novelty will wear of soon. Below, my card which I managed to make and will be delivering this morning. I used a Groovi plate for this my second parchment card. I've not added any colour just used a royal blue card behind for and some beads which was how I attached the parchment to the card. Thanks you for taking the time to look and your kind comments which are always appreciated. I can't believe that it's time for the March Rudolph Days Challenge already, the time has flown by. This month I tried a new (to me) technique called Black Ice, there are lots of videos on the Internet showing how to do this so I won't bore you by telling you how I done this, but needless to say it gives a great effect. 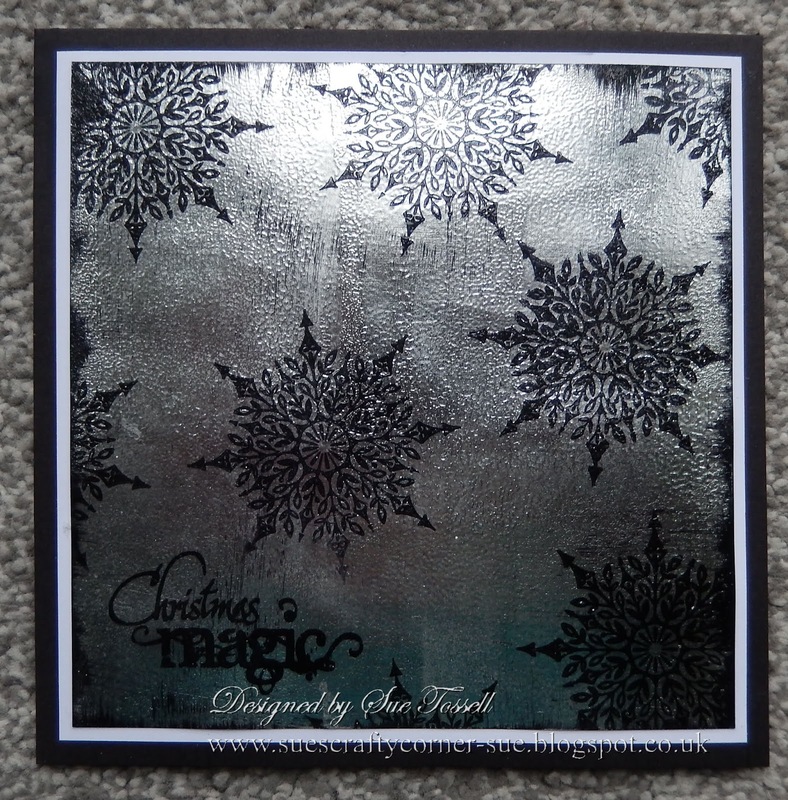 I used Tim Holtz snowflakes stamps with a sentiment stamp from Chocolate Baroque. As usual I made more than one for the box ready for this year. Hi my name is Sue and I live in a small town in the North of Hampshire, with my Husband Steve,who I have been married to for 30+ years and My son Martin. I also ,have a daughter Vicky, who lives nearby with her husband David. I've been crafting most of my life in one form or another, but my passion now is papercrafts and card making. On this blog I hope to share some of the things I make with you.